Markets have taken another swing towards a more positive risk outlook. US earnings season always tends to be a driver for sentiment and the positive numbers from JP Morgan on Friday gave markets a boost into the weekend. The question is whether this move can be sustained. With the earnings boost coming after encouraging trade numbers from China, there has been a significant move out of the safe haven plays. This moves looks set to continue. Bond yields have shot higher in a move that is holding ground today. Given that this was a broad move across major bond markets, this has resulted in the US dollar feeling the squeeze too. Yield differentials have played poorly for the dollar and this remains the case this morning as weakness continues. However, within this move the safe haven yen is the big underperformer, whilst gold is also struggling. 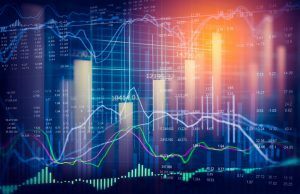 Positive sentiment across markets has seen the VIX Index of volatility in S&P 500 options moving to its lowest level for six months as major equities markets are also feeling a boost. There is little data today to shift this view, but watching the moves on bond markets could be key. If yields begin to temper their move, then we could see some of the sharp moves of Friday beginning to be pared. Wall Street closed strongly higher on Friday with the S&P 500 +0.7% at 2907, although US futures are a very slight amount lower early today. Asian markets have gone with the positive risk move, Nikkei +1.4% and Shanghai Composite +0.6%. European markets are looking mildly positive in early moves, with FTSE futures and DAX futures both around +0.2% higher. In forex majors, there is still a marginal dollar losses across the majors, with the Aussie (which had a big move higher on Friday) a slight underperformer. In commodities, gold and silver are struggling again, whilst oil also continues the consolidation of recent sessions. It is a quiet start to the week on the economic calendar. Traders will be looking out for the New York Fed Manufacturing (Empire State Manufacturing Index) at 1330BST. Data has been relatively sluggish in the past three months, but is expected to tick back up to +7.0 from April (from +3.7 in March). A gauge of risk appetite has broken sharply higher. The Aussie (higher risk major) has broken a key resistance against the yen (key safe haven). AUD/JPY has been restricted under 79.80 but this has now been broken. Throughout 2019 this ceiling has prevented a recovery but a decisive closing breakout above 80 confirms a big shift in sentiment. 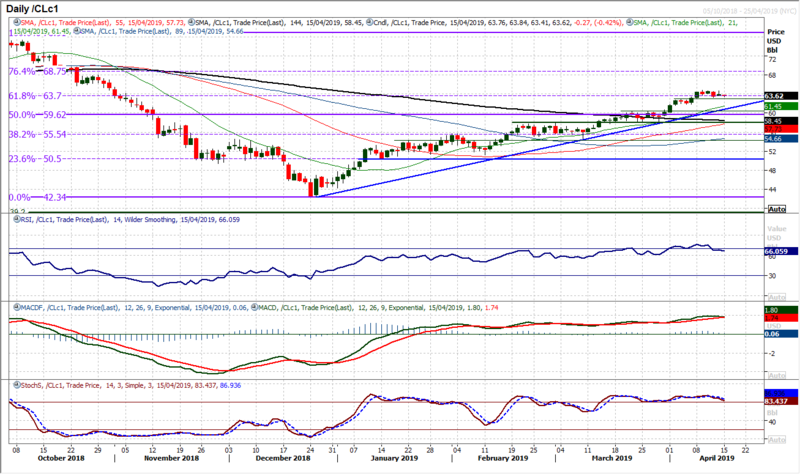 The move comes with the RSI into the mid-60s (a four month high) and upside traction in the MACD. Breaking clear of the 77.50/79.80 range implies 230 pips of upside now towards 82.10, which coincides with the mid-December rebound high. The breakout at 79.80 now becomes a basis of support for a pullback correction. The hourly chart shows 79.60/79.80 is a buy zone. Support at 78.90 is now a key higher low. Initial resistance at 80.50 this morning. The uptrend of the past couple of weeks continues to develop as Friday’s strong bull candle has taken the market to a two and a half week high. The move back above $1.1300 which has in the past been seen as a gauge for sentiment is also encouraging. 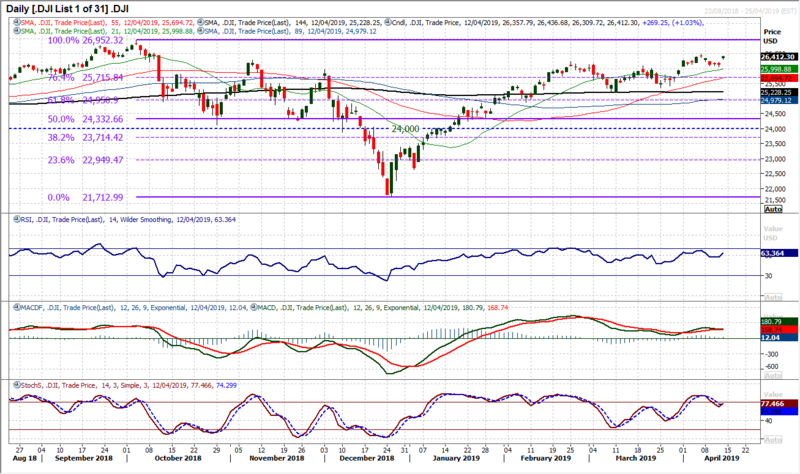 Momentum indicators continue to improve as the Stochastics and MACD lines accelerate and the RSI moves above 50. Rallies of recent months have tended to se the RSI pushing towards 60, so there is still some upside potential in this move. 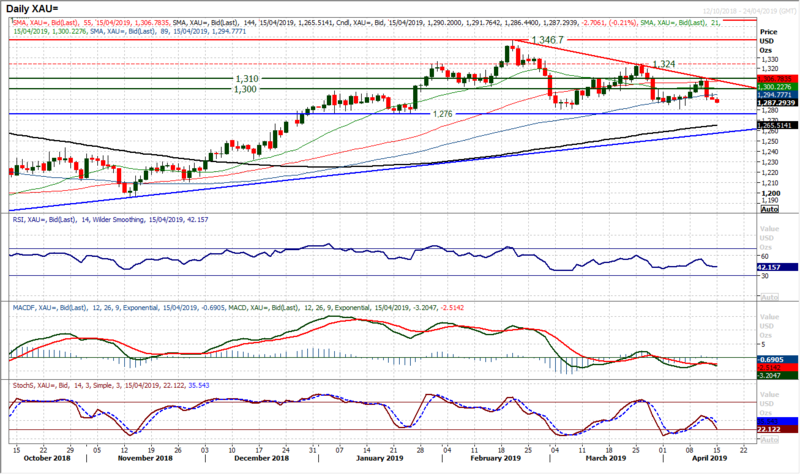 The next resistance above $1.1330 is not until the March high of $1.1450. 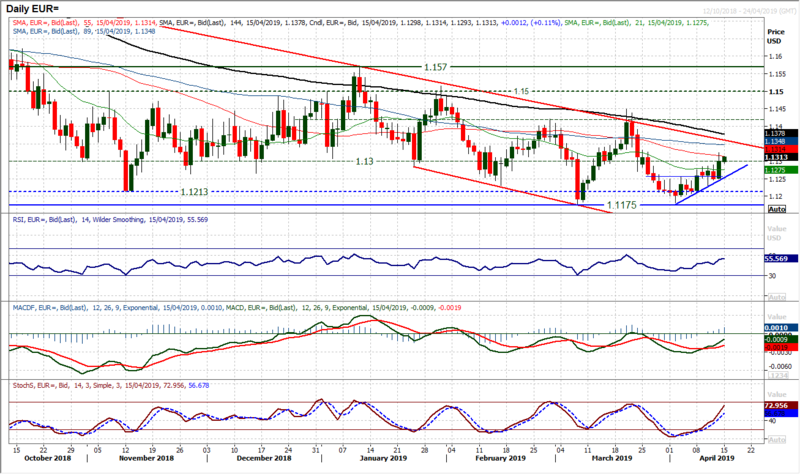 This means that the old medium term downtrend (at $1.1360) is the next gauge of note. Intraday corrections are a chance to buy. The hourly chart shows support between $1.1250/$1.1290. The convergence of the two trend lines is now a key issue for Cable. 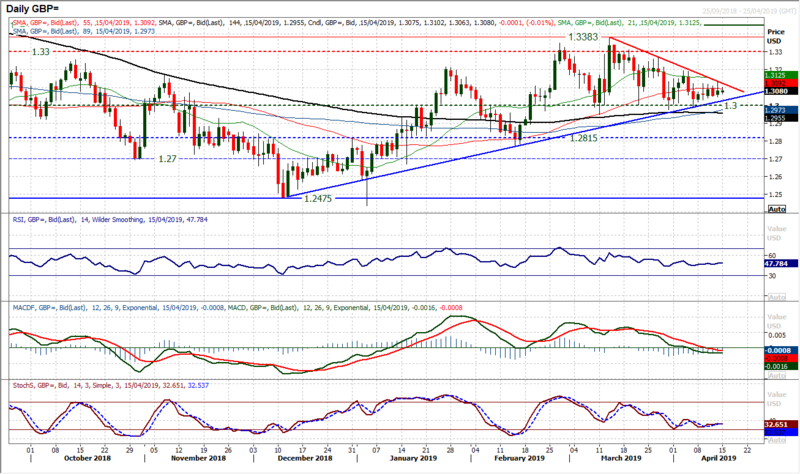 The four month uptrend is supportive at $1.3025 whilst the four week downtrend is resistance at $1.3125. Once more the downtrend limited the market on Friday as this period of consolidation continues. There is the slightest of negative biases on daily momentum, but this is countered on the hourly chart and there is very little to be considered directional on Cable for now. The key floor remains the $1.3000 support which has consistently been defended in recent weeks. A shade of dollar correction today means that the market is ticking higher, but certainly not enough to believe the market will be above to take a view. The becalmed nature of the chart suggests that continued consolidation is most likely. Key levels remain a close below $1.3000 or above $1.3200. The dollar bulls look set to make a move as pressure on the 111.90/112.10 resistance band has resumed. Two solid bull candles put the market in positive position for the new week. However, this is an area of considerable near to medium term resistance. The old November/December lows around 112.20/30 are overhead, whilst the market failed repeatedly at 111.90/112.10 in February/March. Momentum is positively configured, but the rallies have historically struggled around 60 on RSI. Furthermore, the MACD lines are rather tepid. The hourly chart shows a support band 111.60/111.80 could be key to continuing to build the pressure. The rally failure at the long term pivot at $1310 has formed a downtrend of the past 8 weeks. Furthermore, unless the bulls can quickly retrieve $1300 then the significance of this failure at $1310 will take on added importance. The concern is that momentum indicators are showing increasingly worrying configuration for the bulls. The Stochastics crossing back lower around 50 increases the bear pressure, whilst MACD lines are threatening to cross lower under neutral. Both of these would be crosses at successively lower levels and suggest increasing bear control. Is gold increasingly positioning for a test of the crucial $1276/$1280 support? Watch the rallies on the hourly chart failing on the RSI under 50/60 and MACD lines under neutral. A near term pivot is forming at $1296. Initial support is at $1284 as the market edges lower early today. With momentum indicators looking stretched, oil has been consolidating. However, this looks to just be a pause for breath in the uptrend of the past three and a half months. Since February, any hint of correction has found support around previous breakouts as the bulls remain in control. 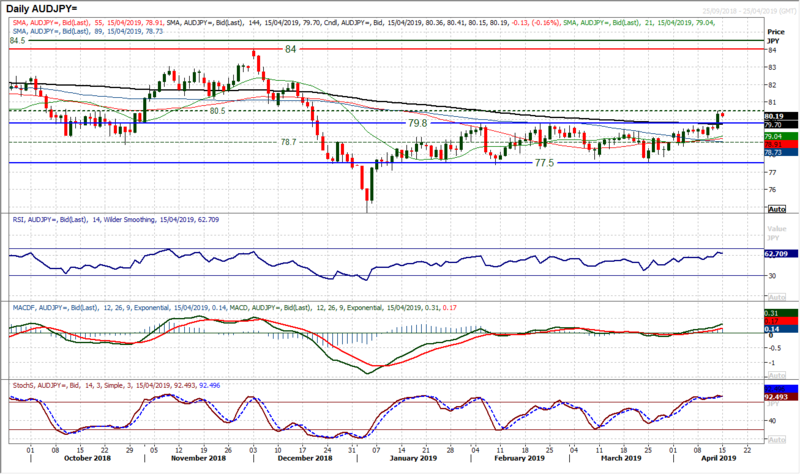 The recent breakout at $63.00 has been a basis of support, whilst WTI has spent much of the past week consolidating around the 61.8% Fibonacci retracement at $63.70. 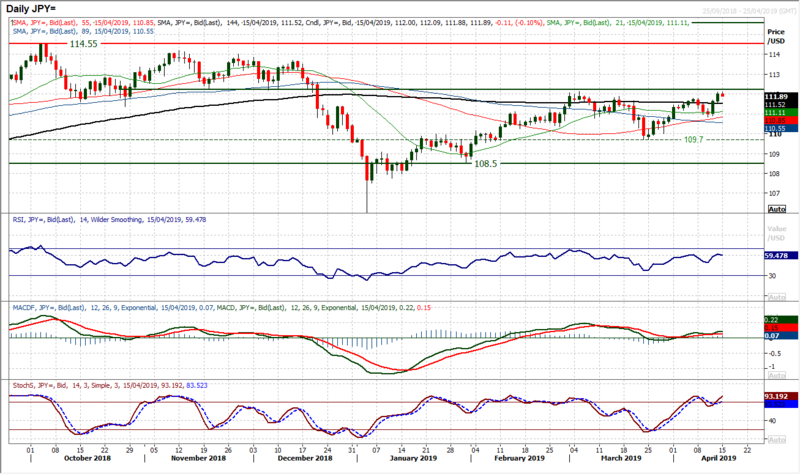 Resistance sits currently at $64.70 with the next resistance at $66.85. Trading decisively clear of the 61.8% Fib level opens 76.4% at $68.75. The bulls remain in decisive control above $61.80, whilst the uptrend support is at $60.85 today. The outlook for the Dow remains positive. Trading above all the moving average with positive configuration on momentum. Corrections are a chance to buy. The question of when to buy in the drift lower is the main issue. Support of the old February/March breakouts has been holding and Friday’s gap higher is a strong signal. The gap is still open at 26,230 but any move to fill this gap should now be seen as a chance to buy. Stochastics are crossing higher, with RSI back above 60, so momentum is strong. Although resistance at 26,488 is still intact, the bulls look ready to push on again for the all-time high of 26,952. The importance of support at 26,062 is growing.